My grandfather makes the best meatballs ever. Unfortunately he’s 2000 miles away so I don’t get them very often, however I have developed my own recipe which is based on his method to yield similar results. Ever since I can remember, it has been tradition in my family to have meatballs with our Christmas Eve meal. One year they turned out exceptionally well, so we asked my grandfather what he did differently and he wouldn’t tell us. As it turns out he thought that we poking at him to find out how he ruined the meatballs because he had almost burnt them in the oven and that was apparently the only thing he did differently than any other year. Eventually we assured him that we really did love the meatballs and fortunately, his slightly overdone meatballs were one of the best happy accidents ever! He now makes them this way purposefully because if he didn’t, we would all be sorely disappointed. 1. 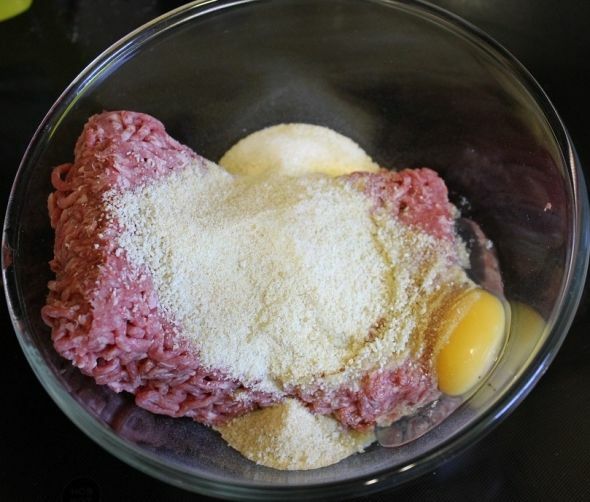 The first step to making meatballs is mixing the meat. The best tool to thoroughly mix this all together is your own clean hand. (two hands aren’t really necessary) Just combine all of the meatballs ingredients in a bowl and squish your fingers right in there to blend everything together. Turn the bowl with your non meaty hand and keep squishing until everything is thoroughly blended. If you have some powder free gloves handy, they can help to ease the discomfort that may be caused from the cold meat. Gloves also help for those who are squeamish about touching raw meat. 2. Next roll them up and line them on a baking sheet. 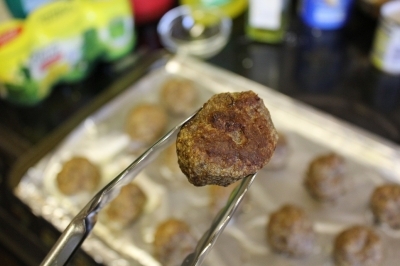 Try to get the meatballs as similar in size as possible so that they will cook evenly. The reason for cooking them this way is that when you put them in sauce they soak it right up and it makes them even more flavorful. 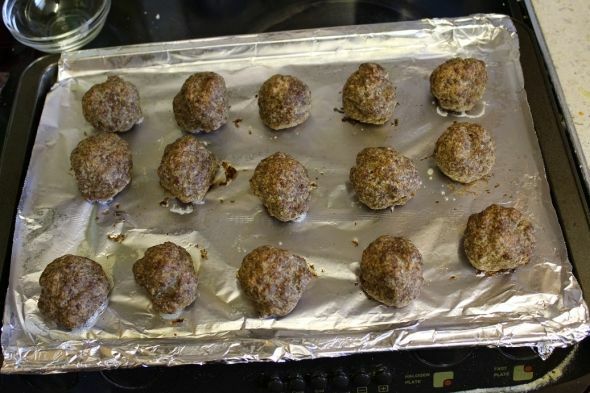 They also maintain a little bit of their crispiness after soaking in the sauce which is an unusual texture for a standard meatball but not at all unwelcome. Notice The Perfect Crusty Bottoms? You can use these meatballs in a variety of sauces but the type of sauce that suits them best as “traditional Bonczek family meatballs” is a lovely acidic tomato sauce. If you have never made your own sauce before I would strongly recommend that you try it sometime. It’s cheap and easy and it is better than anything that’s been jarred. 1. Chop onion and garlic. I like to almost puree my garlic in my mini food processor and then I do the onion separately to achieve a slightly chunkier texture however, you can also do this with a knife, I just really love the lack of hand stink and effort my mini food processor affords me. 2. Fry off the onion and garlic in a sauce pan with a little bit of olive oil until the onion is cooked through. 3. Pour in the chopped tomatoes and tomato puree. 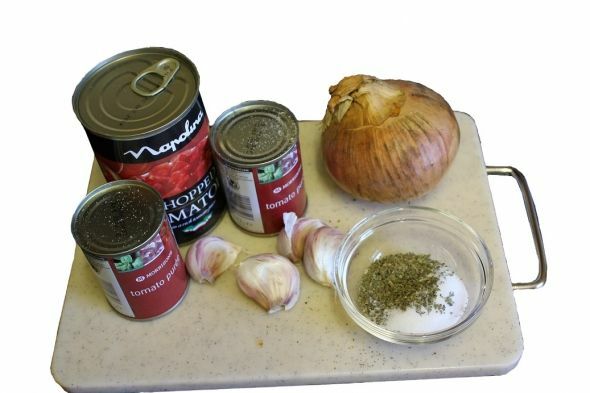 I used to use only one can of tomato puree to one can of chopped tomatoes however lately I’ve been putting two cans of tomato puree to one can of chopped tomatoes to achieve a richer flavor and thicker texture. 4. Pour in the Basil, Oregano and *Sugar. 5. If you aren’t a fan of chunks in your sauce now is a good time to blitz it with a stick blender. I prefer not to do this myself usually. 6. Stir and allow to simmer for 15 minutes. You may have to watch the sauce closely if it is very thick so that the bottom does not burn. 7. 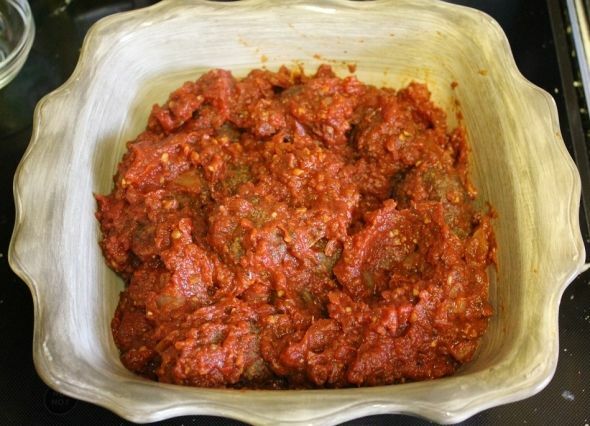 Combine with meatballs and allow them at least a half hour to soak in the sauce before serving. * If you think that sugar is a weird thing to put into tomato sauce just try it without … then seek therapy for the trauma. 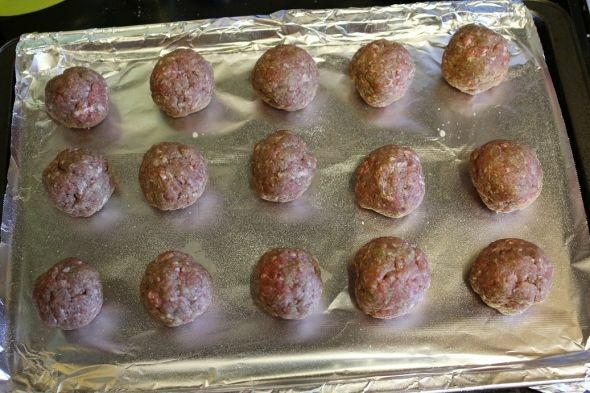 The meatballs without sauce freeze beautifully and I have eaten them up to six months later with no noticeable loss of flavor. I do use a food saver which probably helps immensely though. They will also keep in your fridge with or without sauce for a good few days. The longer they stay in the sauce the better they taste!